< Slipping the jab sets you up perfectly for a double-leg takedown, but the jab can sometimes be a difficult punch to slip, ¡jj Because your opponent is striking with his lead hand, the jab comes at you a whole lot faster than the cross. Timing is imperative, and that comes from practice. When drilling in the academy there are a couple of different scenarios you should focus on. 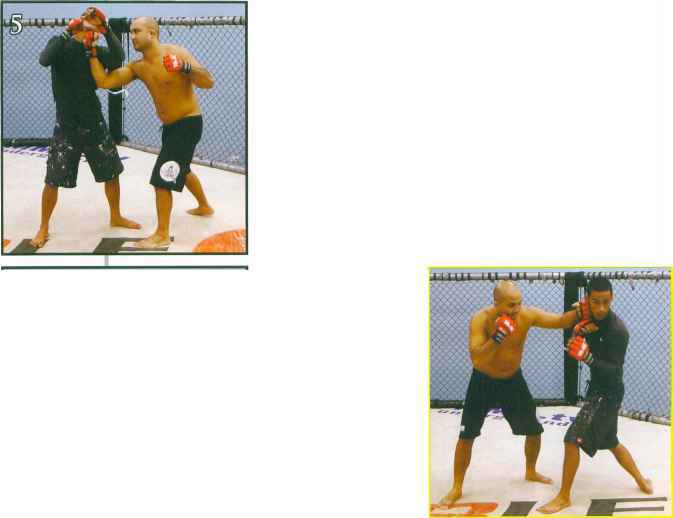 The first is when your opponent throws a long jab from outside the pocket. In order to get the take-yj down, you're going to have to slip the jab and step forward at the same time to cover the distance. If he throws from within the pocket, you should practice shooting for the takedown right off the slip. The nice thing about slipping either W type of jab is that it places your head to the outside of your opponent's body, which means he doesn't have many op-£ tions to counter with other strikes. He can't land his right hand and he can't land his right kick. However, anytime you □ go for a double-leg takedown you become susceptible to a guillotine choke because your head is essentially slipping underneath your opponent's arm. If you employ proper form and maintain good posture, you won't have to worry ^ about the choke. Paco throws a left jab at my face. I slip his punch, drop my level slightly, and shift the majority of my weight onto my right leg. I step my right foot forward. Pushing off my right leg, I explode forward and wrap both arms around the outside of Paco's legs. I step my left foot forward, and then immediately cut the corner by pushing off my right leg and driving to my left side. As I do this, I pull both of Paco's legs to my right. I continue to cut the corner and follow Paco to the ground. Paco all the way to the ground and establish the top position. Although the cross is much harder to slip than the jab, you'll want to spend some time learning this technique because the cross is one strike you definitely want to avoid. The hard part for many is becoming accustomed to moving toward the punch as they slip it. It might seem unnatural at first, but it puts you in range to launch a counter-attack, which could be tying your opponent up with a body-lock and taking him down, throwing an overhand right, or striking to the body. When practicing the slip, it helps to look at your form in the mirror. Your body mechanics should look similar to when you throw a right cross, except with the slip you don't extend your right arm. Having slipped Albert's cross, I return to my standard fighting stance. I'm squared off with Albert in the pocket. As Albert throws a right cross at my face, I slip his punch by rotating my hips and shoulders in a counterclockwise direction and leaning slightly to my left. When you slip an opponent's cross, the dynamics of the slip allows you to simultaneously throw an overhand right. If you choose this option, the momentum of your punch will pull your rear leg forward much like a baseball pitcher's rear leg comes forward after he throws the ball. This not only allows you to take a quick step forward and close the distance between you and your opponent, but it also loads up your hips to throw a left hook. It's an effective combination because as your opponent falls backward from the overhand, you step forward and catch him in the side of the jaw. Albert throws a right cross at my face. As his fist comes at me, I slip his punch by rotating my hips and shoulders in a counterclockwise direction. Using the momentum of the slip, I throw an overhand right. As Albert's fist sails by the side of my face, I come around with an overhand right, nailing him square in the jaw. I follow through with the overhand. Allowing the momentum of my punch to carry my hips forward, I take a small step with my right foot. 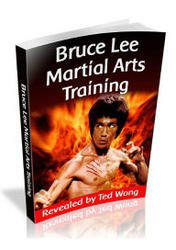 This locks and loads my hips to deliver a left hook. I whip my hips in clockwise direction as I prepare to throw the hook. Still rotating my hips in a clockwise direction, I smash a left hook into the side of Albert's already bludgeoned face. Albert throws a right cross at my face, and I slip his punch by rotating my hips and shoulders in a counterclockwise direction and leaning slightly to my left. Notice how slipping the cross loads my hips up for the body hook. With Albert's right arm extended, his ribs are vulnerable on his right side. I take advantage of this by rotating my hips in a clockwise direction and hammering a hook to his body. When you slip a right cross, the right side of your opponent's body becomes exposed, making it a good time to hammer a hook into his ribs. The body shot creates an opening for an uppercut, and the uppercut rocks your opponent's head back, making him vulnerable to a right cross. If you land all three shots flush, there is a good chance your opponent will go down. Before Albert has a chance to recover, I prepare to throw a left uppercut straight up the middle. My uppercut collides with Albert's chin, lifting his head up and exposing his jaw for the right cross. I finish the counter combination by rotating my hips in a counterclockwise directing and throwing a right cross to Albert's jaw. As Paco throws a straight right cross, I slip his punch by turning my shoulders and hips in a counterclockwise direction. Notice how this movement resembles the movement you make when throwing a cross of your own. The instant I slip the punch, I drop my level and push off my right foot. This allows me to close the distance between us and lock Albert up in a body-lock. Keeping my body-lock tight, I claim the mount position. From here I can work from the mount or work to take Paco's back. Choosing which option to utilize depends largely upon how your opponent reacts to the takedown. If your opponent throws a jab, you can almost guarantee that he will follow up with a cross—it's that common of a combination. Ideally, you want to slip your opponent's jab and shoot right in for the takedown because it allows you to avoid dealing with the cross. However, unless your timing is perfect you won't be able to slip every jab. If you miss your opportunity to slip your opponent's jab and he indeed follows with the cross, slipping it is one of your best options. Personally, I'm accustomed to having my head on my opponent's left side when I shoot in for a double-leg, but because slipping an opponent's cross requires that I move my head all the way across his body, it puts me on his right side. Instead of trying to attempt a double-leg from this position, I will usually just tie him up in a body-lock. From the body-lock you can work to take your opponent down or use one of the other techniques I lay out in the upcoming section. I particularly like the technique I show here because I'm using the momentum of the slip and my opponent's compromised positioning to get the takedown. Continuing to drive forward, I lock my hands together around Paco's waist. It is important to notice the positioning of my hands—they are digging into the soft portion of Paco's midsection, just below his ribs and above his hip. I continue my forward progression by stepping my left foot to the outside of Paco's right leg. Not only does this allow me to trip him, but it also prevents him from stepping back and reestablishing his base. Squeezing the body-lock tight and driving my weight into Paco, I take him to the ground. Notice how I step my right leg over his body—this allows me to instantly claim the mount position. 0 The only time I shoot for a double-leg takedown on a southpaw fighter is when he throws a left cross and I manage to y slip it. The reason it works so well is because the cross squares up my opponent's hips, making his back leg reachable. ^ his front leg is right there. I step my right foot forward, planting it to the outside of Paco's left leg. Driving off my right foot, I cut the corner and step my left foot to the outside of Paco's right leg. As I drive to my left, he quickly loses balance and begins falling to the mat. I follow Paco to the mat and pin him up against the cage. slip his punch by dropping my level, slightly rotating my hips and shoulders in a clockwise direction, and placing the majority of my weight on my right leg. As Paco's punch sails by the side of my head, I push off my right leg to close the distance and then wrap both arms around the back of his legs. It is important to note that I am not slipping the punch and then shooting in. As I'm slipping, I'm already moving into position to execute the double-leg. The hook is a difficult strike to spot because it approaches from the side rather than straight on. It's also a difficult strike to evade because it often requires dropping down into a crouched stance, which involves moving your whole body. However, if you manage to slip your opponent's hook, you'll most likely get the takedown. If you sense the double-leg will be hard to achieve because the momentum of your opponent's hook staggered his hips, obtaining a body-lock and working for the takedown from there is a good alternative. As Albert throws a left hook, I slip his punch by dropping down into a crouched stance. Once Albert's hook clears my head, I pop back up into my standard stance. I'm in a standard fighting stance, squared off with Albert in the pocket. When you slip an opponent's hook, a lot of times the momentum of his punch will carry his body around, opening his entire midsection for an attack. In such a situation, a good option is to send a powerful hook to his kidney. If you land with any kind of force, your opponent's body will defensively coil into your fist. As you already know, I like to follow this up with an uppercut because there is almost always an opening to land it. The uppercut lifts my opponent's head, making him vulnerable to the always devastating left hook. I've ended the sequence on this last punch, but you can always keep coming with more—a right cross, a double-leg takedown, whatever. As the hook soars past my head, I chamber my right hand and prepare to throw a right body hook to Albert's kidney. I land a right body shot to Albert's kidney. He immediately reacts by coiling his body into my fist, creating an opening for the right uppercut. I immediately follow the upper-cut with a left hook to the right side of Albert's face. I come straight up the middle with a right uppercut. This rocks Albert's head back, creating an opening for the left hook.